These fried Indian breads are delicious not made very often as they are fried in butter/ghee, so we save them for a special occasion. They are heavier than roti, flaky and crispy and one is often enough, especially if you are filling it. You can serve these as an accompaniment to your rice and curry or have it for lunch. Sift the flour and make a well, add the ghee/butter and the water and knead into a soft pliable dough. Knead for 8-10 min and then place in a bowl and cover for 20 min. 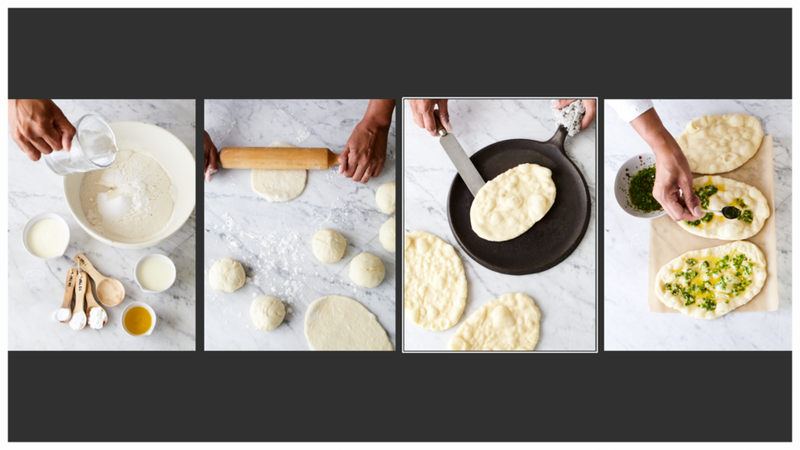 Divide the dough into 8-10 portions, roll each portion out into a circle, 16-18 cm (it does not have to be perfect. Brush the entire surface with the melted butter /ghee (at this point you can add your flavourings) and then starting at the edge of the bread roll into a tight log (a little bit like a Swiss roll). Then coil the roll into a tight disc, flatten with your palm and roll out again into a circle, dusting with flour as you go. Aim to get around 16-18 cm circle. Heat a non-stick pan or flat griddle pan and add some melted butter or ghee, gently add the paratha and cook for about 10 sec, flip over and drizzle more melted butter/ghee around the edges, tipping the pan so its evenly distributed, flip with a spatula again until its golden and crispy, set aside and cover with foil, you can leave in a warm oven until you have cooked them all. Spicy and tangy mash potato – boil 3-4 small potatoes with salt, once soft, add ¼ tsp of chilli powder and a squeeze of lemon juice, and a small handful of fresh finely chopped coriander or spinach (optional), mix well. Using a spoon gently spread a thin layer on a rolled out paratha, and then roll into the swiss roll log, coil and flatten and roll out. It is important here not to stuff too much onto the paratha as it will end up with holes and not roll out smoothly, with the topping leaking out. Once you have done this a few times, you can experiment with other boiled vegetables or finely minced lamb or beef. Cardamom Chocolate Puddings Serve this gorgeous rich dessert in small glasses, about shot glass size. Freshly ground cardamom seeds will give the best flavour but you could use ¼ teaspoon or less of cardamom powder if you don’t have the pods. Coconut Chicken Curry This easy, delicious curry is one of my mother’s signature dishes. Serve it with basmati rice and naan or poppadoms. These are the best home made crackers, easy, healthy and so moorish. I cannot take credit for the recipe though, this was given to me by a colleague, not sure which uber healthy cookbook its from, note to self, I must find out! But in the meantime, here it is, serve with cheese, dips, or nibble on them any time of day to your hearts content. Pre heat the oven to 180 C. Put all the seeds, salt and flour to a large bowl and mix to combine. Add the water and oil and mix to form a dough. Divide the dough in half and roll each one between two sheets of baking paper. Approx 3-4m thick. Transfer to baking trays and remove the top sheet and sprinkle with sea salt, bake for 15-20 min or until slightly golden. Cool on wire racks and then break into chunks, they keep well in an air tight container for 1-2 weeks. My baby turned 11 in February, and as I refelct on the past year, sometimes I cant help thinking, how time flies and we have to cherish every moment. So this year Zara had seen a gorgeous cake she wanted, a moist chocolate cake (4 layers) with pale pink buttercream icing, and a topping of hundred's and thousands, with a surprise inside! I baked 2 whole cakes and 2 with a hole in them, and once cool and ready to be iced, I started with a whole cake, then adding the cake with a 'hole', sandwiching with butter icing, then the 3rd cake with the 'hole', then adding 6-7 pkts of smarties, and then the final whole cake on top. Then butter icing to all 4 layers, with a generous sprinkling of hundred's and thousands. A cake fit for a princess!